This fully furnished home has spectacular views from almost every room, built with an open plan flow and extensive floor-to-ceiling glass panels. The house is very eco friendly, and is cosy in winter with underfloor heating. In summer the house is cooled by utilising natural breezes by cross ventilation. Although the property has a few stairs, the entire upper level is wheelchair accessible, (contact me for further details). Contact me for discounts (20%) for periods longer than a week. For longer periods (going to write a book perhaps?) we can discuss further. Blenheim (30mins drive), the centre of the Marlborough wine-growing area, with over 20 wineries to choose from, and a selection of gourmet dining, bars, artisan food outlets and art galleries. Nelson, Kaikoura, and the Nelson Lakes National Park are also nearby. It is a perfect base for vineyard touring, (cellar door tastings, vineyard gourmet lunches). It is also an ideal location for boat tours, swimming with dolphins, walking, bike tours, and adventure activities. Or just enjoy the ever-changing unobstructed views from your luxury home base, a perfect place for a truly memorable visit to New Zealand’s South Island. Waikawa is 3kms from Picton, which is the terminus for the Inter Island Ferry. Shuttles are available for transport to and from the ferry and the airport in Blenheim. The nearest shops/cafes/restaurants are in Picton. One last thing I have never cancelled a booking, so you can be assured of stable travel plans. Ideal for couples, vineyard tourers, travelers, writers and longer-term stays. Fabulous house for those who love ultra modern. All windows open up, floor to ceiling with gorgeous views of the sound and bird song in the morning. Under floor heat keeps it warm in the evenings and at night when you can look out to the harbor and admire the bobbing lights on the many boats. Thank you for all the extras in the kitchen, We enjoyed the bubbly and chocolate. Had a wonderful time traveling to wineries and eating wonderful food everywhere, and it was great to come home to so much room and every modern convenience. It couldn’t have been nicer. Thank you so much for sharing your house with us! It’s an exceptional property. Very modern and clean. Wonderful views. Great kitchen. Only thing sadly missing was a barbecue. What a delightful stay we had! It's hard to capture in words or pictures how lovely this house is. We slept with the windows open, which meant we had lovely gentle breezes all night and woke to the sound of birds and the view of the sleepy local harbor. The kitchen is so well stocked with everything you could possibly need to cook up a feast with local fish and lamb - Nigel is generous with sharing his utensils, appliances, oils and all the spices you could possibly need. We loved the welcome champagne and chocolate and the breakfast items - eggs, milk, etc. It just gave us a feeling of home and warmth. The beds are comfortable, showers are great. We didn't want to leave and dream of coming back. We loved it so much we stayed put our entire stay. Why run around when you have the best home and view. We are so grateful to have stayed at this fancy home, and deeply appreciate Nigel's hospitality. Wow!! Everything about this property is incredible - the view, the quality of the property, a fabulous kitchen (great for our Christmas dinner) and the little touches to make your stay perfect. A nice easy walk down to the marina and we even walked into Picton. The property is on a hill which gives it the amazing views. We would definitely stay again. Don’t look any further - book! Stunning home matched by stunning views...perfect Picton base within luxurious surroundings. From booking to departure Nigel’s care and attention made the whole process very easy. Rosewarne is everything you could want for a perfect Picton escape. 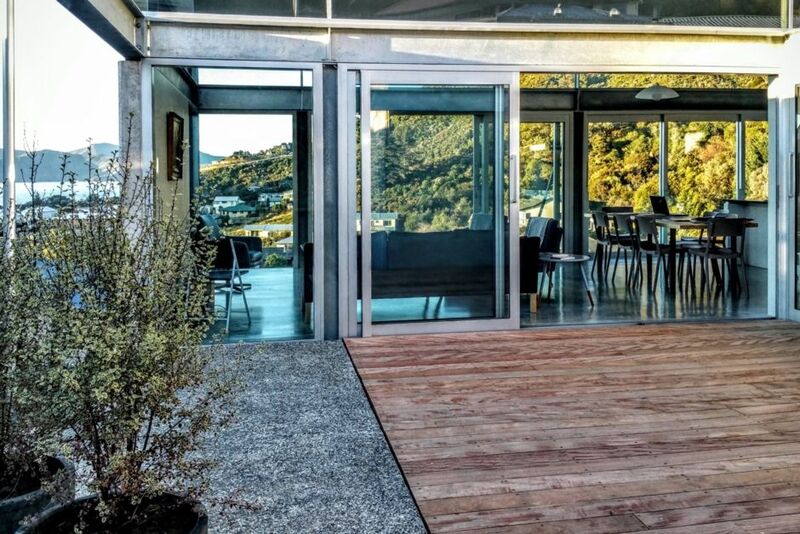 Stunning architecture matched by equally stunning views of Waikawa Bay and beyond you would never tire of. The home is well equipped with ample space for friends/family to gather together for meals but equally offers the opportunity to have your own space. Instructions for the home are well set out and adds to the enjoyment of being there. There is plenty of information on how to make the most of what Marlborough has to offer its visitors both at the house and through Nigel’s email contact prior to our visit. Super comfy beds and welcoming treats in the fridge were appreciated. We loved our time here and will put it at the top of our list to return. Highly recommended...you won’t be disappointed! Bernie is a friendly person and great to communicate with. They were excellent guests, and left the house in perfect condition. They are very welcome back any time. Fantastic place to stay, gorgeous views, everything 5 stars. The house, kitchen all fitted out nicely, comfortable beds, obviously somewhat modern as one can see, but still manages to have charm. If I was being picky it could use a long bench or something opposite the main bed to set suitcases and/or clothing on, some of us don't bend over to the floor as easily as we used to! I am very glad we stayed here instead of Nelson, drove through Nelson, too big, staying near Picton was a good choice.